I’ve been excited to make this bundt cake for a very long time. It’s my all-time favorite cake recipe. It’s SO chocolatey, moist, gooey goodness. And I wanted to decorate it for Easter! So what better way to celebrate St. Patrick’s Day than to make an Easter cake? Haha! Yes, sometimes I am THAT blogger…the one putting up Christmas decorations in October so I can post pictures for all of you. But seriously, I bet you wish you ate dinner at my house tonight. Isn’t it cute? I love how this turned out. And as a wonderful treat, it tasted even BETTER than it looks (which doesn’t always happen for me!) If you are a chocolate lover, you have got to try this recipe. And then you will never go back to another recipe. For the topping, I melted white chocolate chips mixed with a little olive oil to make it more pourable. HOW TO MELT CHOCOLATE THE FAST WAY: Put about 1-2 cups chocolate chips in a microwavable bowl. Microwave for 1 minute, then stir. Microwave in 30 second intervals until it’s melted. Add in about 1-2 Tablespoons of oil to improve consistency. First I put a ball of tin foil in the middle hole so I wouldn’t have to fill it so much. Then I drizzled the chocolate over the cake and coaxed it to drip in the crevices. I toasted about 1 1/2 cup of coconut on 350 for about 7 minutes. Just put it in a cookie sheet. It will seem burned on the edges but mix it up to get a nice ratio of toasted flakes versus white. Then put the coconut on the cake and make a little ‘nest’ of it in the middle. 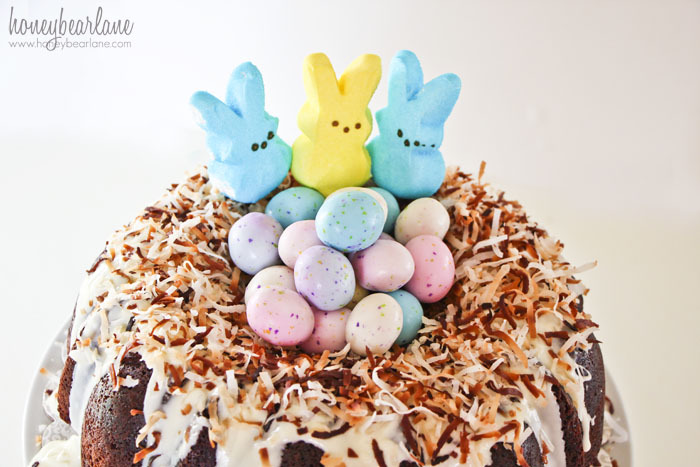 Add a few robin eggs candy and some Peeps on skewers and you’ve got yourself a delicious and beautiful Easter cake! 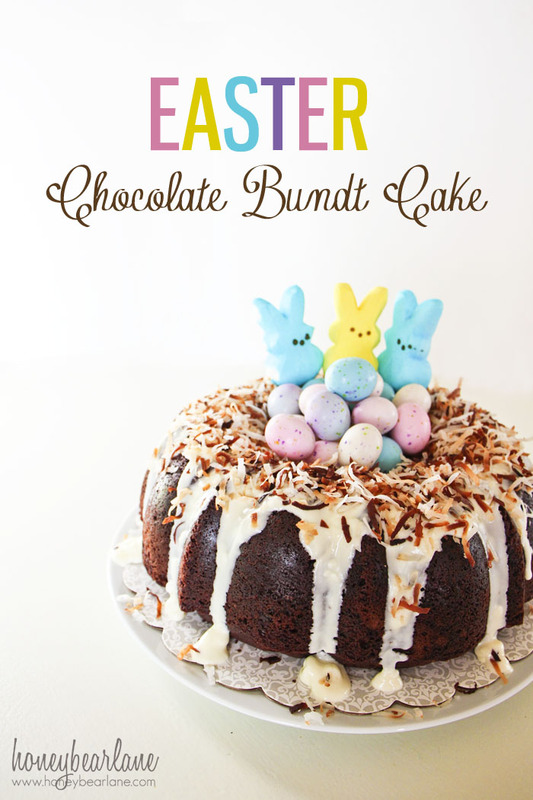 Do you make a fun Easter dinner and dessert for your family? What are you planning on making this year? Linking up to Saving 4 Six, Tidy Mom, The Pin Junkie and Katherine’s Corner. this is darling!! i want to make this, cute idea!! 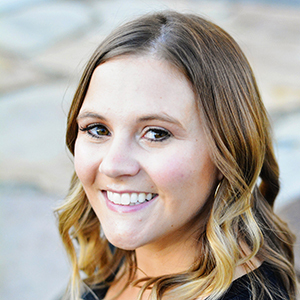 Thanks Kirstie! It was amazingly delish! So yummy and festive… I am pinning! Are you suppose to put the cake in the freezer when it is still in the pan? Do you let the cake cool before you put it in the freezer?. I really want to try this for Easter. Put it in the freezer after it comes out of the oven, don’t let it cool first…this preserves the moistness. Good luck! It’s very cute and I love a doctored up cake mix! last minute. Also, do you just cover the top of the pan with foil, or wrap the whole pan? Thanks! Yes you can put it in the freezer after baking–I think it actually stays more moist that way. Just be sure to take it out to defrost with plenty of time! And just cover the top with foil.